The Arris SURFboard SB6141 is your best bet. This post was done in partnership with The Wirecutter, a buyer's guide to the best technology. Read the full article here. After researching 88 cable modems this year, the Arris SURFboard SB6141 DOCSIS 3.0 remains the cable modem we recommend for most people. It's compatible with seven of the nine biggest ISPs—including Comcast, Time Warner Cable, Cox, and Charter—and it supports the Internet speeds available to the vast majority of Americans. Our pick is popular and reliable, and it gives you the most flexibility for switching providers if you move somewhere else (or if you're lucky enough to have multiple ISPs to choose from). You should also get a new modem if yours doesn't support DOCSIS 3.0, the current iteration of the Data Over Cable Service Interface Specification that governs how cable operators deliver high-speed Internet. If you've had your modem for a few years, give the model name a quick Google search; you might still be using a modem that supports only DOCSIS 2.0. Don't buy our cable modem picks if you're using DSL or fiber, which use entirely different standards from DOCSIS. Also, don't buy it if you use your cable provider for telephone service: The models we cover here don't have phone ports. Finally, if your Internet plan has download speeds of 150 Mbps or greater, you'll need a higher-end modem like the Arris SURFBoard SB6183. All DOCSIS 3.0 modems support at least four downstream channels and four upstream channels. Downstream channels are more important because they impact streaming and download speeds—and your new cable modem should support at least eight. An 8×4 cable modem—with eight downstream channels and four upstream—gives most people plenty of overhead to upgrade to faster service later. It also does a better job of handling your ISP's network congestion than a 4×4 cable modem, because each channel is almost like a separate connection: If one channel is congested, another channel may have capacity. Although Comcast recommends people buy a 16×4 modem, and Cox prefers a 24×8 model, those are both overkill for most Internet plans slower than 150 Mbps. We started our research by going through all of the DOCSIS 3.0 modems that work with the nation's eight biggest ISPs—Comcast, Time Warner Cable, Charter, Cablevision, Suddenlink, Mediacom, WideOpenWest, and Cable One—as well as Cox. We didn't include (and don't recommend) modems that double as wireless routers. Nobody really reviews cable modems—it's difficult to do because you can't know whether it's the modem or your ISP that's to blame for slower speeds, so the few reviews that exist aren't very scientific. We also don't have the ability to test multiple modems on multiple ISPs ourselves. We looked at the Amazon reviews of these modems to be sure that people who owned them didn't have any issues with the devices or their manufacturers' customer support. 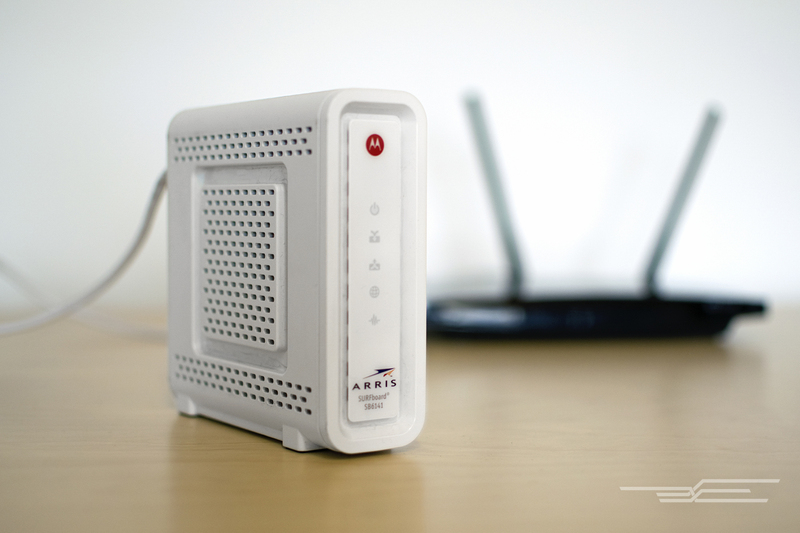 The Arris SURFboard SB6141 cable modem is the best choice for most people because it's compatible with six of the eight biggest US cable ISPs—including the top three—as well as Cox. It supports speeds much faster than most people's Internet plans, and it has thousands of glowing Amazon reviews and a history of reliability. The SB6141 has an 8×4 channel configuration, which means it should work for all Internet plans up to about 150 Mbps. It's also less expensive than an a 16x4 modem, letting you recoup your money faster. Plus, if your Internet plan doesn't require a 16×4 modem, you're unlikely to get a speed boost by using one instead of an 8×4 modem. Our pick is the most popular purchase for visitors at Buy A Cable Modem. On Amazon, the SB6141 is the site's best-selling cable modem, with a rating of 4.4 stars (out of five) across 9,450 reviews. Though the SB6141's one-year warranty seems short, cable modems are extremely reliable—so much so that you could even buy a refurbished or used version of the SB6141 to save money. If it works for the first week, chances are it will work for a long time because there are no moving parts to wear out. You'll need the SB6183 for very fast Internet plans like Comcast's 250Mbps or Time Warner Cable's 300Mbps offerings. 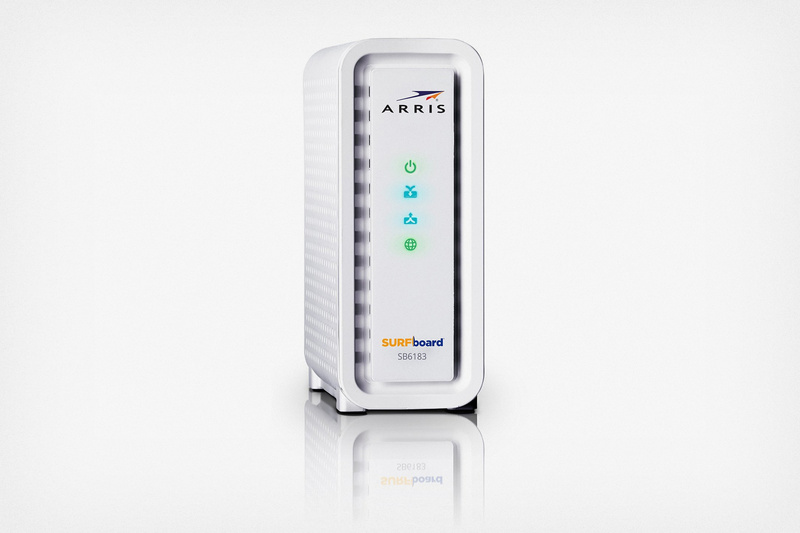 The Arris SURFboard SB6183 is a 16×4 cable modem that works with the fastest listed Internet plans from the nation's three biggest ISPs (Comcast, Time Warner Cable, and Charter), as well as from Cox, Suddenlink, and Cable One. The SB6183 has 16 downstream channels—twice as many as the SB6141. Very few people have an Internet plan fast enough to need a 16×4 modem, but some ISPs require one for plans that an 8×4 modem could theoretically handle. For example, you'll need a 16×4 modem like the SB6183 on Comcast's Extreme 250 plan, Time Warner Cable's 300Mbps plan, and Cox's Ultimate tier. On Amazon, the SB6183 is the second best-selling cable modem (after the SB6141), with a rating of 4.5 stars (out of five) across 1,473 reviews. On Buy A Cable Modem, the SB6183 is the best-selling 16×4 cable modem. A cable modem doesn't have any settings you need to adjust; you don't even update the firmware yourself. Your modem's manufacturer will deploy firmware updates for your ISP to send to your modem (as long as your ISP still supports the modem). Just connect the modem to your cable company's coaxial line, connect your modem to your router with an Ethernet cable, and plug the cable modem and the router in. Because its configuration page does not require a login, the Arris SURFboard SB6141 is vulnerable to cross-site-scripting attacks that trick you into rebooting your modem or restoring it to factory settings. Such an attack is more annoying than dangerous, but it can cause you to lose your Internet connection for anywhere from a couple of minutes to half an hour. To prevent this kind of attack, go into your router's configuration page and block access to the IP address 192.168.100.1 (the modem's configuration page) for anyone inside your network.